Lithography and nanofabrication is used to produce micro and nano scale devices for a wide variety of applications such as biosensors, waveguides, micro electromechanical systems (MEMS) and microfluidics. A combination of lithography, deposition and etching can create all kinds of intricate structures. We help with designing, patterning and fabricating your devices for rapid prototyping and proof-of-principle development. Our advanced range of lithography and nanofabrication tools can produce anything from thin film transistors to lab-on-a-chip systems. Overcome the diffraction limit to produce nano-scale features. Small feature sizes maximise substrate use, and often correlate with high power efficiency and high operating frequency for your devices. Flexible and affordable solution for rapid prototyping of simple devices using a scanning electron microscope. Tungsten (W) filament for patterning features greater than 100 nanometers. 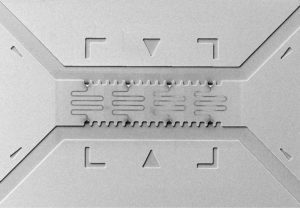 Optical lithography may be used for high-throughput patterning of micro scale structures. Full wafer UV illumination through a mask for fast, repeatable exposures. Single micron resolution with vacuum contact. Direct write optical lithography solution with no need for a mask. Single micron resolution with 0.25 micron alignment accuracy for overlaying multiple exposures with previously fabricated structures. Device fabrication is achieved using a variety of deposition methods capable of processing any material you need. Structures are defined using the lift-off process or etching. Magnetron sputtering, both RF and DC. Reactive ion etching, and deep reactive ion etching.